Please allow a minimum of 48 hours for pickup. Cannot be prepared without a valid phone number, credit card and email address. We will email you to verify order and give you pickup time and date. All internet orders will be wrapped for FOUR people. Freezer Special #1 $109.99 Wrapped according to family size. Limited to ONE substitution per package. 4 Rib Eye Steaks - 12 oz ea. 4 Pkg Ground Chuck - 1 lb ea. 2 Pkg. Cube Steak - 2 ea. 4 Pkg Pork Chops - 2 ea. 1 Boneless Pot Roast - 2 1/2 lb 2 Whole Chickens 2 Cut Up Chickens 4 Pkg ..
Freezer Special #2 $129.99 Wrapped according to family size. Limited to ONE substitution per package. 4 Rib Eye Steaks - 12 oz ea. 1 Rump Roast - 3 lb 3 Pkg Pork Chops - 4 ea.pkg 5 Pkg Ground Chuck - 1 lb ea. 20 Chuck Patties - 10 per pkg. 2 Whole Chickens 2 Cut Up Chickens 25 All Meat..
Freezer Special #3 $99.99 Wrapped according to family size. Limited to ONE substitution per package. 4 Pkg. Ground Chuck - 1lb each 1 Pot Roast 3 lb 2 Pkg Cube Steaks - 3 each 4 Rib Eye Steaks - 10 oz.each 1 Whole Chicken 1 Cut Up Chicken 2 Stuffed Pork Chops 2 Pkg. Pork Chops - 4 each..
Freezer Special #4 $149.99 Wrapped according to family size. Limited to ONE substitution per package. 4 Rib Eye Steaks - 12oz each 2 London Broils - 2 1/2 lb each 3 Pkg Pork Chops - 4 each 1 Rump Roast - 3 lb 5 Pkg Ground Chuck - 1 lb each 20 Chuck Patties - 10 to a package 2 Whole Chick..
Freezer Special #5 $74.99 Wrapped according to family size. Limited to ONE substitution per package. 4 Pkg Ground Chuck - 1/2 lb each 2 Rib Eye Steaks - 10 oz each 2 Pkg Beef Liver - 2 Slices Each (currently we have no liver and are substituting Ground Chuck) 2 Stuffed Pork Chops 2 Pkg Bonel..
Spring Freezer Special $99.99 Wrapped according to family size. Limited to ONE substitution per package. 1 Sirloin Steak - 2lb 4 Chicken Mignons 3 Pkg Ground Chuck - 1lb each 20 Hot Dogs 10 1/4 lb Chuck Patties 5 lb Chicken Leg 1/4's (Currently we are substituting equal in dollar value, ch..
Summer Freezer Special $99.99 Wrapped according to family size. Limited to ONE substitution per package. 4 Pkg Ground Chuck - 1lb each 4 New York Strip Steaks - 8 oz each 3 lb Country Ribs 2 Pkg Bacon - 1lb each 8 Split Chicken Breast 4 lb Baby Back Ribs 2 lb Sirloin Steak 3 Pkg Italian S..
Fall Freezer Special $99.99 Wrapped according to family size. Limited to ONE substitution per package. 1 Pot Roast - 2lb 8 Split Chicken Breast 1 Pork Roast - 2lb 2 Pkg Beef Stew - 1lb each 8 Pork Chops 2 Pkg Breakfast Sausage - 1lb each 2 Pkg Ground Chuck - 1lb each 2lb Sirloin Steak 1lb..
Winter Freezer Special $99.99 Wrapped according to family size. Limited to ONE substitution per package. 3 Cut Up Chickens 3 Pkg Italian Sausage - 1 lb each 3 T- Bone Steaks 3 Pkg Stew Meat - 1 lb each 3 lb Chicken Leg 1//4's (currently we are substituting equal in dollar value, Chicken Thig..
Gourmet Freezer Special $84.99 Wrapped according to family size. Limited to ONE substitution per package. 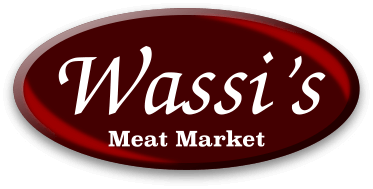 2 Filet Mignons - 8oz each 2 Stuffed Cornish Hens 2 Chicken Mignons 2 Crab Stuffed Flounder 2 lb Baby Back Ribs 1 lb Large Shrimp 1 lb Scallops Please allow a minimum of 48 hours for p..
Wassi's Meat Market is a family owned and operated, upscale meat market in southeast Florida.